A porcelain crown is a type of dental crown used to cover and encase a tooth. 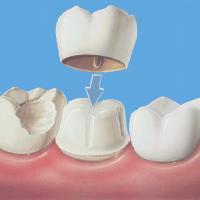 Dental crowns are sometimes referred to as tooth caps or dental caps and are used to restore a tooth to its normal shape and size, strengthening and improving the appearance of the tooth. If your tooth requires a crown, and is visible when you smile, cosmetic dentist Dr. Roy Daniels most often will recommend a porcelain crown. While not as strong as a gold or metal crown, porcelain crowns are far more natural looking and aesthetically pleasing. Why do teeth need porcelain crowns? How long will a porcelain crown last? Maintaining good oral health practices is the key to long-lasting porcelain crowns. The teeth that have porcelain crowns attached should be kept extra clean and free of dental plaque. If you follow our dental hygienist’s cleaning guidelines, you can expect your porcelain crowns to last at least 10 years and, in many cases, indefinitely. How does a porcelain crown compare to a gold or metal crown? How long does it take to fit a porcelain crown? Generally, you will need to see Dr. Daniels on two separate occasions to have a porcelain crown fitted. Your specific circumstances will determine how long each appointment lasts. Do I need a porcelain crown? If you have a chipped, weakened or crooked tooth, a porcelain crown may be right for you. A porcelain crown is certainly right for you if you need a crown fitted on your front and/or visible teeth. To learn more about porcelain crowns and discuss your options, please schedule a porcelain crowns consultation with Dr. Daniels by contacting our porcelain crowns office today. Dr. Roy Daniels helps dental patients throughout Sedona, Cottonwood, Cornville, Flagstaff, Clarkdale and Munds Park achieve bright Sedona smiles with crowns.